SEL begins with sociability, which you can encourage by teaching social skills early, creating shared social norms, and engaging students in cooperative learning. What helps children engage in learning? According to studies on the social nature of how we acquire knowledge, one answer is clear: Children engage in learning through their cooperative capacity to interact with others. We often call this sociability, and we recognize it in children when we observe their enjoyment of being together -- chatting, joking, laughing, working, and creating friendships. It is through these interactions that kids make the invisible visible, cross boundaries into new spheres of learning, and initiate thoughts and feelings that help them chart pathways through life. While we know that some children are more naturally extroverted or introverted than others, all children can learn the skills for working together to build relationships necessary for human thriving. We don't have to look far for research that shows the benefits of sociability and its related social-emotional skills. These skills are developed in children through relational experiences both inside and outside of the classroom. In modern times, these "softer" skills have been most recognized and valued by social scientists whose research has linked them to positive development and wellbeing. But recently, even economists have taken note. In a paper published by Columbia University in 2015, The Economic Value of Social and Emotional Learning (PDF, 324KB), evidence suggests that classroom efforts to improve sociability are well worth the costs. In an analysis of six different school-based SEL programs, all were found to have measurable benefits, such as reduced aggression and improved impulse control, from 3-13 times their costs to schools. 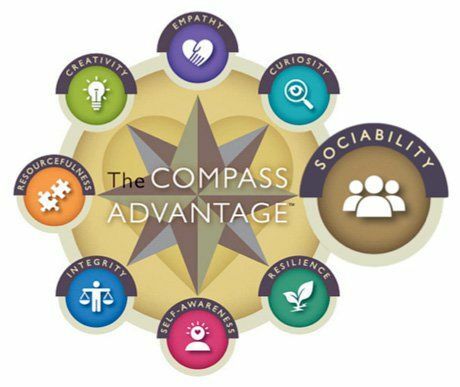 Sociability is part of The Compass Advantage™ (a model designed for engaging families, schools, and communities in the principles of positive youth development) because it is at the core of social learning and emotional wellbeing. Intricately woven with the other abilities on the Compass, sociability plays a big role in the development of curiosity, resilience, self-awareness, integrity, resourcefulness, creativity, and empathy. Linked by research to lifelong learning and happiness, sociability is one of the 8 Pathways to Every Student’s Success. The cooperative ability to engage with others is critical to successful learning communities. 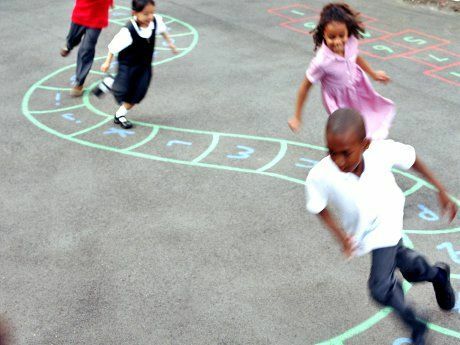 Whether that community is a classroom or after-school activity, sociability flourishes when kids feel connected, respected, cared about, and when they can communicate their feelings of connectivity with others. Not only does sociability give children an advantage in school, but it's also seen by today's business leaders as key to leading, managing, and innovating in a world of increasing complexity. 1. Teach social skills early. One of the most effective strategies to teach social skills in elementary school is to create a common social language that becomes part of the classroom culture. This language contains familiar, understandable ways to communicate with others, including how to listen, show gratitude, or apologize. If your school hasn't yet implemented a social-skills training program, you can gain insights and great materials from a number of successful programs, including The Toolbox Project, Project Happiness, and Responsive Classroom. 2. Create shared social norms. Sociability is increased when students learn to cooperate with each other. The problem in many schools and classrooms is that cooperation is undervalued. Instead, many kids feel a need to compete for power, status, or achievement. Instead of thinking about how to create order in classrooms, it is more important to think about how to create a collaborative learning community. This means that we need to shift from more traditional leadership approaches that force cooperation through rules and compliance to ways that we can give kids a voice in creating their own shared social norms. When students are actively engaged in setting social norms, research shows that cooperative behavior and learning increases. As a result of their involvement, students come to own the belief that cooperation is the right way to behave. It is also an experiential lesson in democracy and social responsibility. The Morning Meeting has shown excellent success as a place for students to reflect on what kind of classroom would best support their learning. In this setting, teachers become facilitators as students discuss ways in which they would feel most supported, including how they should treat each other, what it means to respect different opinions and ways of learning, and what happens when they disagree. 3. Engage students in cooperative learning. When there is joint ownership of an outcome, children learn to work together. Regardless of the subject matter, research shows that students who work together in small groups learn better and retain knowledge longer than when the same content is presented in other formats. In fact, children know this intuitively. When Heather Wolpert-Gawron asked her eighth grade students what engaged them most, it was no surprise that "working with their peers" was first on their list. Cooperative learning, also known as collaborative learning, involves working together with peers toward a common goal. Often, it involves collectively identifying and studying real-world problems, interacting with classmates, and assessing each other's contributions, such as in project-based learning. When children learn in these kinds of supportive, relational groups, they not only learn better, they develop sociability and social skills that strengthen their relationships and prepare them for successful careers. What role does sociability play in your classroom or school, and how do you foster it?